None of us would dream of sitting an exam or going for an important job interview without preparing. Likewise if you were on an aeroplane and found out the pilot and crew hadn’t performed the routine pre-departure checks you would be outraged and feel that they were taking an unnecessary chance with your life. Likewise with intubation the child and their parents are putting their trust in you to do your best to keep the child safe during a procedure, and if you want to do this to the best of your ability (and why wouldn’t you) you must prepare properly. 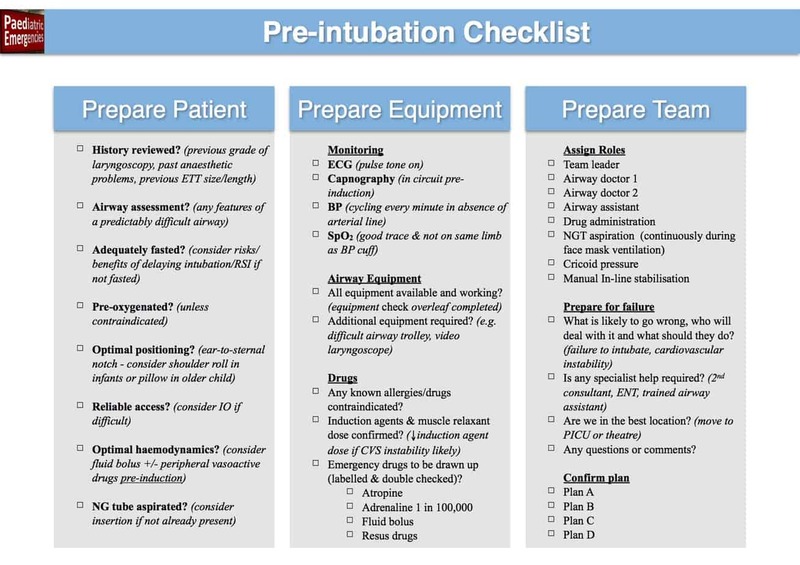 Preparation for intubation can be divided up into the following three steps: Preparing the patient, preparing the equipment and preparing the team. This chapter will deal with each of these in turn. Difficult anatomical intubation – Due to the patient’s anatomy (poor mouth opening, limited neck extension, micrognathia, macroglossia etc) the process of getting a view of the laryngeal opening to allow passage of an endotracheal tube is difficult. Difficult cardiovascular intubation – Due to the patient’s coexisting medical problems (congenital heart disease, myocarditis, septic shock etc) the process of giving an anaesthetic to facilitate intubation is likely to result in cardiovascular collapse. 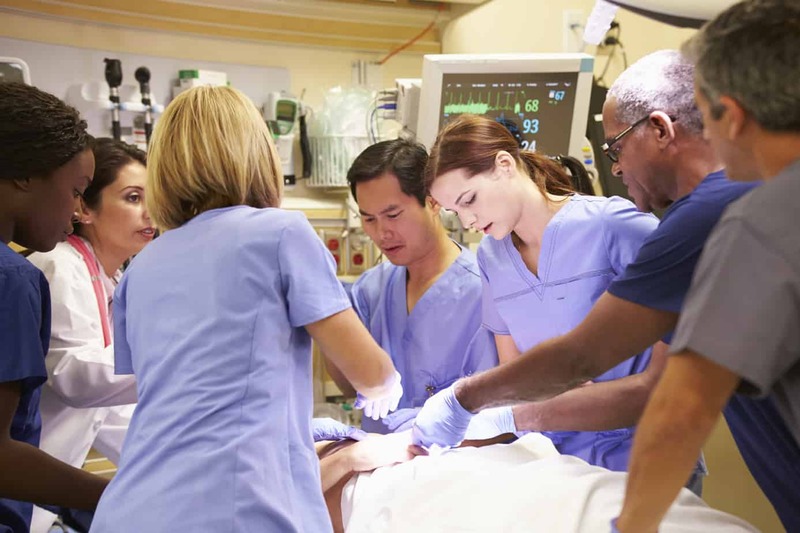 Difficult situational intubation – While elective intubation would normally be straight forward, the current circumstances (working outside of normal environment or team, lack of airway assistant or equipment, conflict in the team, lack of time to prepare fully e.g. cardiac arrest) make the process difficult. As well as looking for factors that may predict difficulty with intubation, a full history and examination should be performed paying particular attention to past medical history, medications, allergies and personal or family history of difficulties with anaesthesia. Records of previous intubations should be reviewed in the patient’s notes or anaesthetic charts in particular looking for grade of laryngoscopy, previous difficulties and how any problems were dealt with. 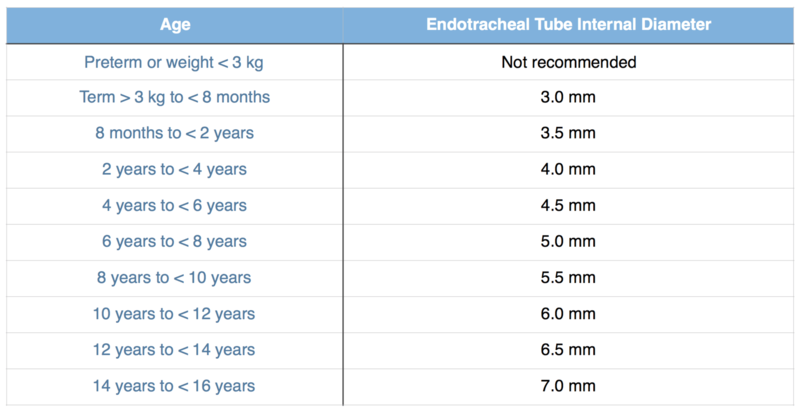 Even if there wasn’t any previous difficulties a recent record may provide useful information about the correct size and length of endotracheal tube. If the child isn’t adequately fasted the risks/benefits of delaying intubation till they are should be considered. Under normal elective circumstances a child fasted according to the above rules should have an empty stomach and therefore should be at low risk of aspiration during anaesthesia (in the absence of other risk factors such as as bowel obstruction or gastro-oesophageal reflux). However gastric emptying in the critically ill child can be significantly delayed, meaning all critically ill children should be regarded as having a full stomach (as the video below demonstrates) and additional precautions to reduce the risk of aspiration during anaesthesia considered (see Intubation in Special Circumstances for further details). The goal of pre-oxygenation is denitrogenation of the lungs (replacing the dominant gas nitrogen with oxygen) therefore building up a reservoir of oxygen in the lungs. During intubation even through the patient isn’t breathing, oxygen can still move from the lungs to the circulation by diffusion and if the patient has been adequately pre-oxygenated this should significantly increase the time to desaturation and allow more time for intubation (particularly useful should intubation prove difficult or in infants who desaturate quickly). Pre-oxygenation can be achieved by having the child breathing spontaneously in 100% oxygen for 3 minutes via a tight fitting face mask (to avoid entrainment of room air). This should be completed prior to induction of anaesthesia provided it isn’t contraindicated e.g. duct dependant congenital heart disease or extreme preterm (risk of retinopathy of prematurity) – in these circumstances the patient is commonly pre-oxygenated with a FiO2 of 0.3 – 0.4. Critically ill children requiring intubation commonly have atelectasis and should therefore be pre-oxygenated with PEEP as this recruits collapsed areas of the lungs therefore maximising the space to be filled with oxygen. Prior to induction of anaesthesia ensure that the bed is at a comfortable height for you and that the patient’s head is positioned close enough to the end of the bed to avoid stretching. To ensure you get the best view with direct laryngoscopy it is important that you do your best to line up the oral, pharyngeal and tracheal axes prior to starting by ensuring that the tragus of the ear is alined with level of the sternal notch in the horizontal axis. Most children will naturally adopt this position without intervention, however neonates and small infants may require a roll under their shoulders and older children and adolescents often require a pillow under their head. Obese patients may require substantial ramping to achieve this position. Consideration should also be given to maintaining the bed in a slight head-up incline, as this will help with oxygenation in patients with respiratory failure and will also reduce the risk of aspiration. Ensure intravenous access is well secured and working prior to induction of anaesthesia – it’s better to discover that the line is not working before you start rather than when you need to administer atropine for bradycardia. 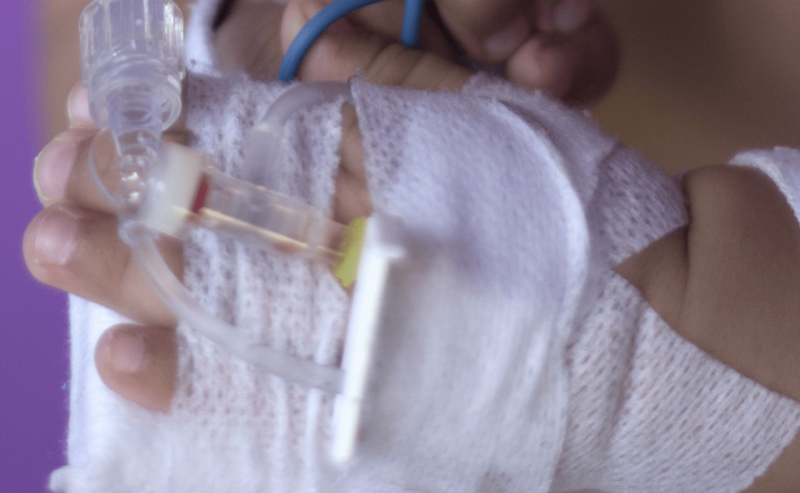 If intravenous access is proving difficult and delaying intubation in a deteriorating child insert an intraosseous line and get on with the intubation – intravenous access will often be much easier following intubation. 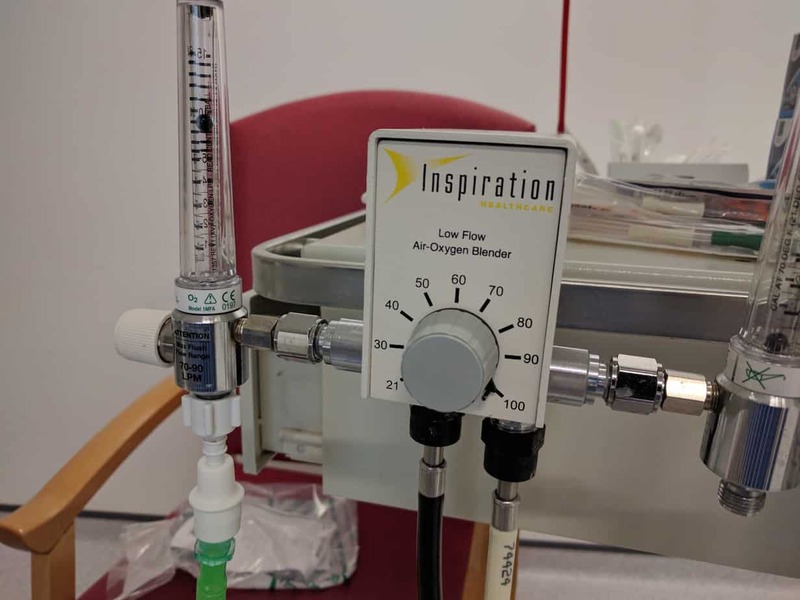 Use of a gas induction in the absence of intravenous access in an elective intubation is common practice in the anaesthetic room. However the benefits of this approach rarely outweigh the risks in the emergency intubation in the critically ill child (in the absence of upper airway obstruction). Volatile anaesthetic agents commonly cause hypotension in well children and will not be well tolerated by the crashing critically ill child who is highly likely to deteriorate with intubation and need some form of rescue medication or fluid (which will require intravenous or intraosseous access) – so ensure you have reliable working access before inducing anaesthesia in the critically ill child (in the absence of upper airway obstruction). There is no such thing as a cardio-stable induction agent in a critically ill child. The administration of even a significantly reduced dose of ketamine is likely to result in haemodynamic compromise in the shocked child. Therefore if your haemodynamics are not good before you start or if your patient seems haemodynamically stable but is at high risk cardiovascular collapse with anaesthesia e.g. sepsis, congenital heart disease, myocarditis, you must try and optimise them before the induction of anaesthesia. Consider fluid bolus +/- vasoactive drugs which can be given peripherally (see Intubation in Special Circumstances for further details). Even if the child has is adequately fasted there is no guarantee that the stomach is empty. 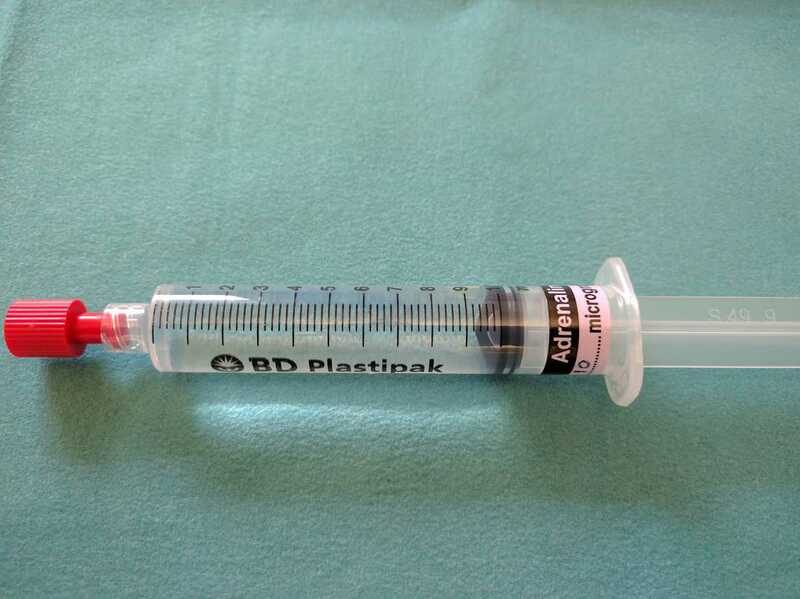 It therefore makes sense that if there is a nasogastric tube in situ, that it should be aspirated using an enteral syringe in an attempt to reduce the risk of aspiration prior to induction of anaesthesia. If the patient doesn’t have a nasogastric tube in situ consideration should be given to inserting one after weighing up the risks (inducing vomiting, respiratory deterioration secondary to increased agitation) and benefits (aspiration of gastric content prior to induction and of air during face mask ventilation) on a case by case basis. Peripheral oxygen saturations (SpO2) – ensure you have a good trace and that it isn’t on the same limb as the blood pressure cuff (inflation of the cuff will cause loss of the saturation trace). ECG – turn on the pulse tone so you will be able to hear changes in heart rate and oxygen saturations without looking at the monitor. Non-Invasive Blood Pressure (NIBP) – have this cycling every minute in the absence of an arterial line. Capnography – this is the gold standard way of confirming that the endotracheal tube is in the trachea. We would recommend use of a continuous waveform device where possible as this offers a number of advantages over the colourmetric devices. Waveform capnography provides an actual number for ETCO2 (the colourmetric devices just tells you whether it is present or not), allowing trends to be monitored over time and also the pattern of the waveform can provide useful information about the lungs e.g. obstruction in asthma). Although both devices can give false negatives if they become wet with secretions, a small baby or a patient with a low cardiac output may not generate enough CO2 to change the colourmetric device, however it is unusual for this to be a problem with the waveform device. Both devices can give false positives in the event of oesophageal intubation due to the presence of CO2 in the stomach (particularly if the patient has recently had a carbonated drink), however this is often detected more quickly with the waveform device as the waveform produced is abnormal, while the colourmetric device will provide the same information as if the tube was in the trachea. It is recommended to add the capnometer to the bagging circuit prior to induction of anaesthesia where the presence of a CO2 trace can be used to help determine the adequacy of face mask ventilation. The capnometer should be added to the circuit between the angle piece and the bag, rather than the angle piece and the mask, as it is less likely to get left out of the circuit when changing the bagging circuit from the mask to the endotracheal tube. Provided it isn’t contraindicated set the oxygen blender to 100%, turn the flowmeter to the required level and ensure it is working. An oxygen cylinder should also be available in the event of mains oxygen failure. Ensure you have the correct size of face mask prior to starting (if the patient is between sizes have both masks available). Additional air can be added to the cuff using an intravenous syringe via the port located at the top of the mask. Unlike in adults it is rare to perform a classical rapid sequence induction in critically ill children due the speed they desaturate with apnoea. This means you need a device to provide face mask ventilation during the apnoea period, while waiting for the muscle relaxant to take effect, prior to intubation. This combined with the fact that it has already been mentioned that pre-oxygenation should be done with PEEP, means a non-rebreather oxygen mask is not helpful for pre-oxygenation of the critically ill child. 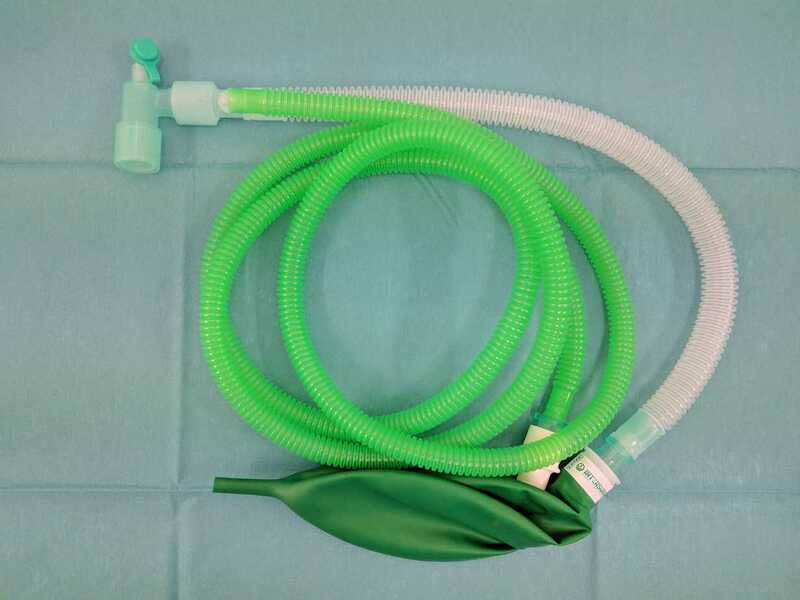 The Bag Valve Mask (BVM) is familiar to most and can be fitted with a PEEP valve to allow the administration of PEEP. 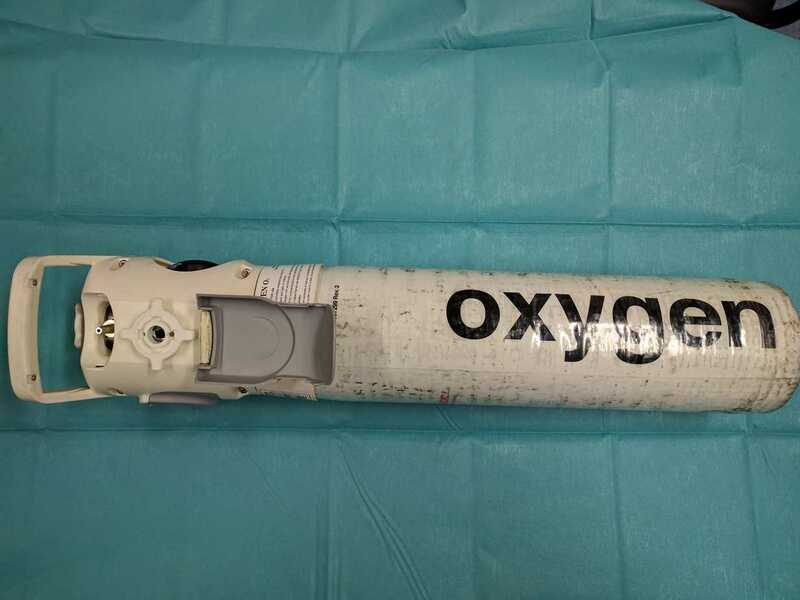 It has the added advantage of not needing an oxygen supply to function, making it particularly suited to the pre-hospital environment were supplemental oxygen is limited. Circuits such as the Jackson-Rees’ modification of the Ayre’s T-piece (suitable for use < 20 kg) or the Mapleson C circuit (suitable for use ≥ 20 kg) do require some more practise to use, but time spent learning to use them is rewarded with more control over PEEP and ventilation (see Bagging Circuits for more information). If you plan to use one of the anaesthetic circuits as your primary device, you must also have a BVM available in case of oxygen failure. 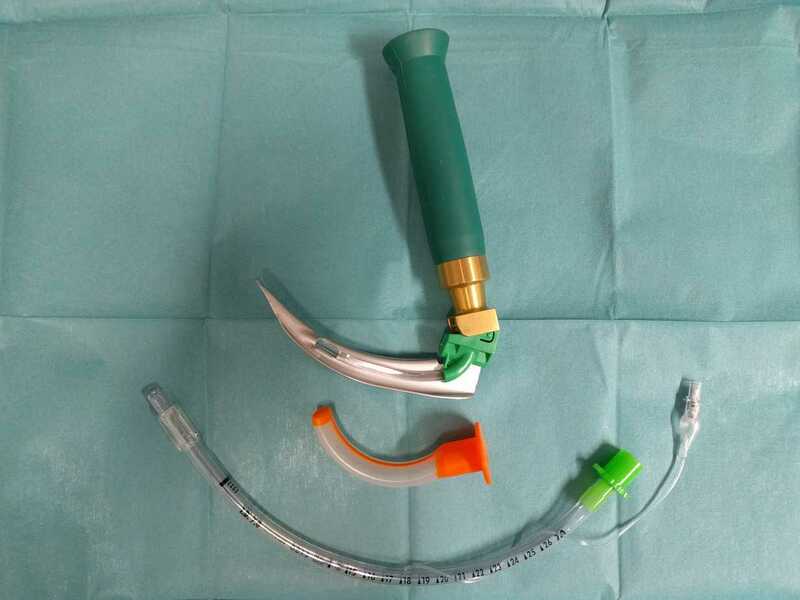 Use of an oropharyngeal or Guedel airway is commonly taught on resuscitation courses and most people are happy with sizing one (distance from middle of incisors to angle of jaw) and with how to insert one (rotational technique used in adults or inserting the correct way up and using laryngoscope blade to depress tongue in younger children). However outside the setting of a cardiac arrest or resuscitation course classroom, use of this really valuable device is often forgotten about. Inexperienced operators frequently deal with difficult face mask ventilation, when muscle tone is lost on induction of anaesthesia, by making hurried attempts to intubate the patient prior to the muscle relaxant having taken full effect. The problems with this approach is that the intubation conditions will be suboptimal as the muscle relaxant hasn’t been allowed time to take effect and although the saturations may still appear satisfactory the reservoir of oxygen built up in the lungs during the pre-oxygenation period is already being used up, meaning the time for intubation without desaturation is significantly reduced. 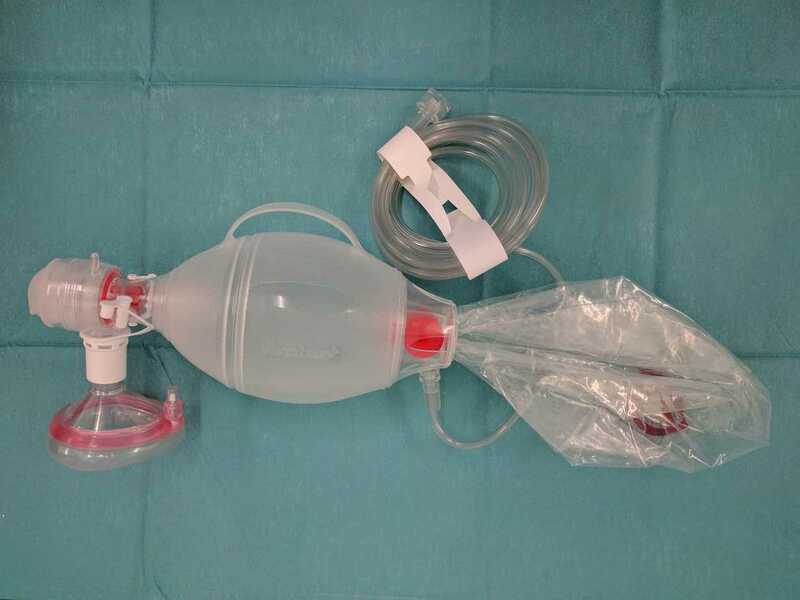 An alternative approach is to simply insert a pre-sized oropharyngeal airway when face mask ventilation becomes difficult, which normally results in easy face mask ventilation, allowing a controlled intubation with the best intubating conditions. The oropharyngeal airway is a really useful bit of kit and an appropriately sized one should be at hand for every intubation. For this purpose the oropharyngeal airway is generally more useful than a nasopharyngeal airway as the oropharyngeal airway is generally more effective, quicker to insert and less likely to cause trauma. The nasopharyngeal airway does however come in handy in the semi-conscious patient or where mouth opening is limited. 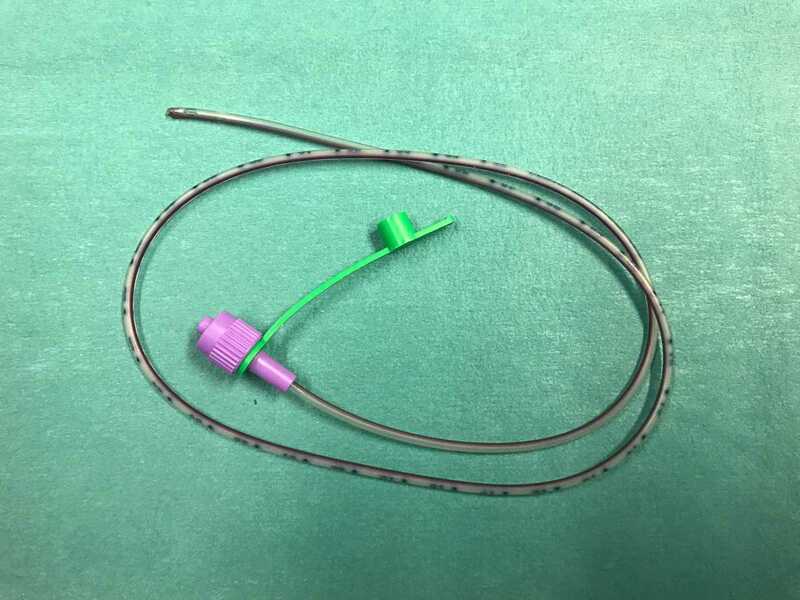 It is important that you have a large bore suction catheter available to deal with any secretions or vomit in the airway. Check that suction is working and position it in the same place each time you do an intubation e.g. under the patients right shoulder or ask your assistant to pass it to you. 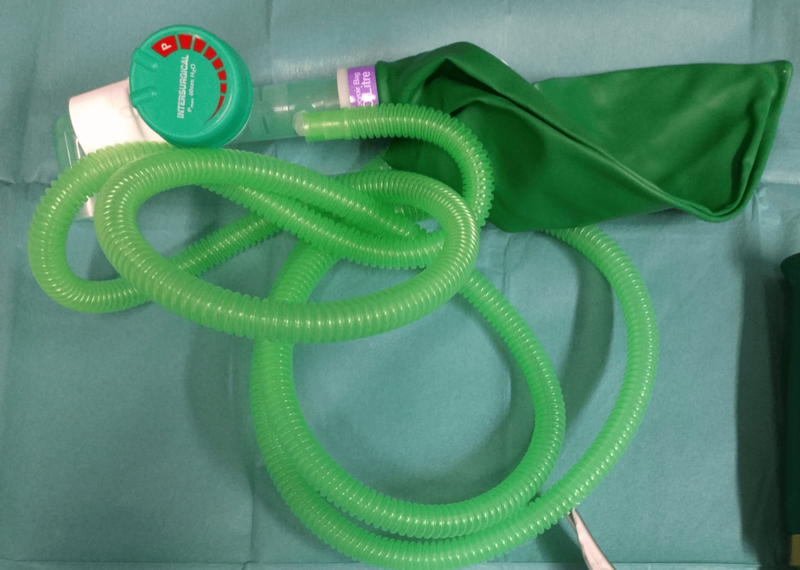 An appropriately sized flexible suction catheter (see table below) should also be immediately available to deal with any secretions in the chest or tube immediately following intubation. 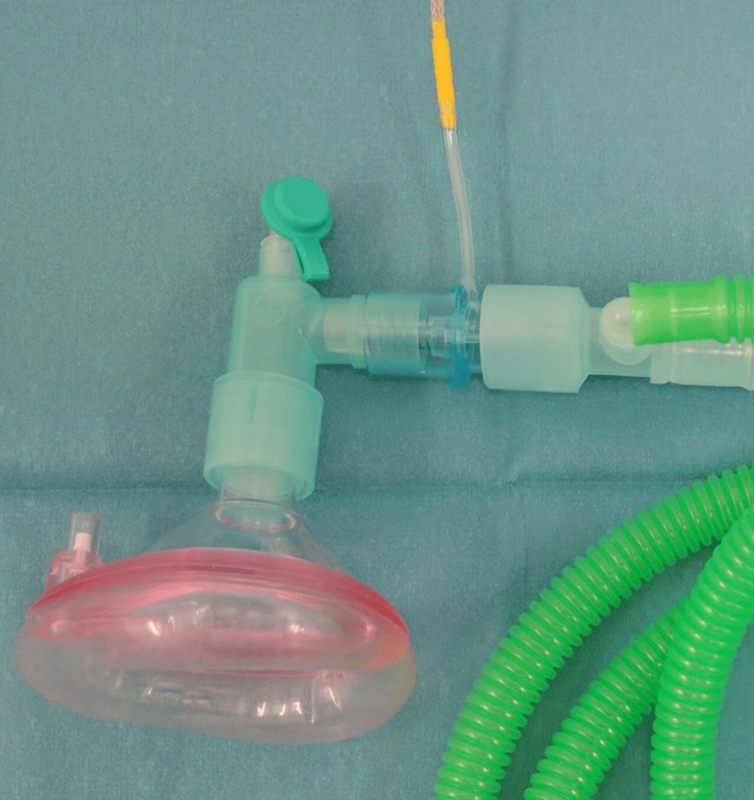 The video below demonstrates the importance of having a flexible suction catheter to hand, and in fact routinely suctioning the endotracheal tube following intubation in all patients with LRTI/bronchiolitis should strongly be considered. Copious secretions filling the endotracheal tube immediately following intubation making ventilation difficult. As already mentioned it is rare that a classical rapid sequence induction (RSI) is performed in critically ill children and it is common practice to provide face mask ventilation during the apnoea period, prior to intubation. Despite best intentions and even with good technique the stomach often gets inflated with the lungs. If not decompressed gastric distention can quickly cause diaphragmatic splitting and impair ventilation. Therefore even if you have decided not to insert as nasogastric tube prior to induction, a nasogastric tube and large enteral syringe must be immediately available to decompress the stomach. Traditionally children under the age of 8-10 years were intubated with uncuffed endotracheal tubes due to concerns about subglottic stenosis and cuffed tubes were only used in this age group in special circumstances such as burns and asthma. 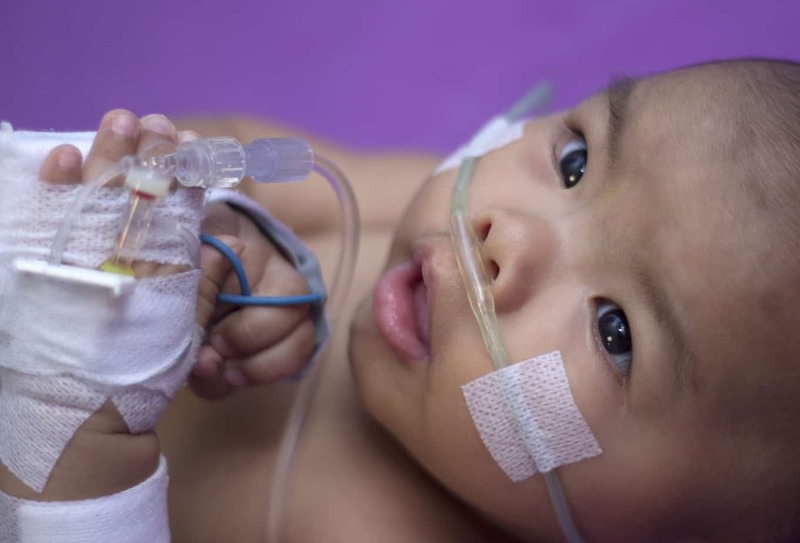 In recent years there has been a trend towards using cuffed endotracheal tubes routinely in all children due to the advantages of improved ventilation and a lower rate of reintubation due to leak from an uncuffed tube that is too small. 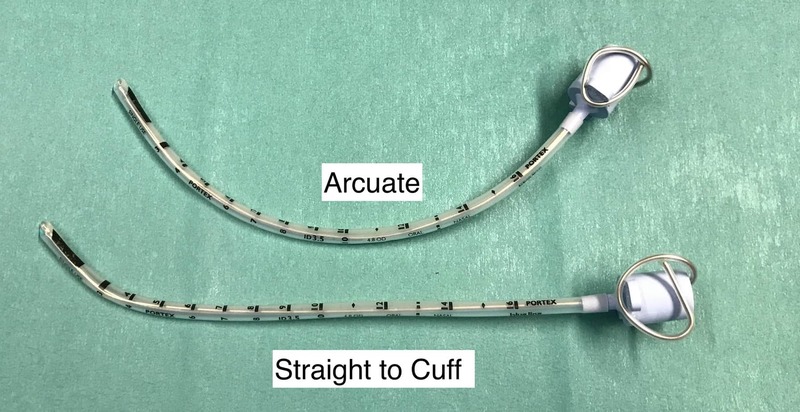 Provided the cuffed tube is appropriately sized, its use isn’t contraindicated (preterm or weight < 3 kg) and cuff pressures are monitored, their use in children appears to be safe and is supported by major resuscitation guidelines. 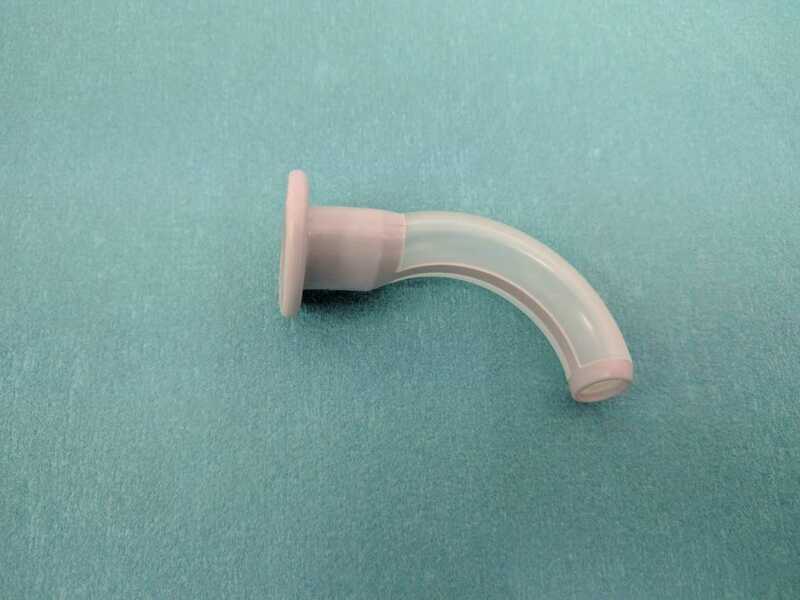 The Microcuff tube is the only currently available cuffed endotracheal tube specifically designed for the paediatric airway and has a number of advantages over the other traditional cuffed tubes (see podcast on Should cuffed endotracheal tubes be used routinely in critically ill children? for more details). For these reasons I would recommend that critically ill children are intubated with a Microcuff tube provided it isn’t contraindicated. You may notice that the endotracheal tube has a bevel at its tip. This serves two functions, firstly it aids insertion through the cords (the pointed tip aids its passage and angle of the bevel on the left hand side of the tube prevents the view of the cords being obscured as tube is passed from the right hand side). Secondly if the tube becomes caught on the anterior tracheal rings after passing through the cords, rotating the tube will allow the bevel to roll off the rings and down into the trachea. Another feature also visible in the above image is the small hole in the side wall near the tip called the Murphy’s Eye, which allows ventilation to be maintained should the hole at the end of the tube become obstructed. You will also notice most endotracheal tubes have depth markers which are designed to be positioned at the level of the cords to aid correct positioning of the endotracheal tube in the mid trachea. The accuracy of these depth marker in children varies widely between manufacturers with some being grossly inaccurate as the linked article demonstrates. 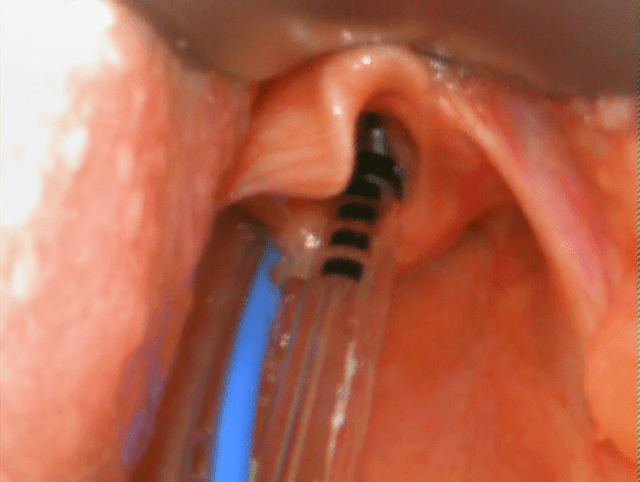 It showed 15 brands of endotracheal tubes positioned at the mid trachea (MT) level demonstrating that many of the depth markers are far away from the glottic level (GL) line and what is more concerning is that many of the endotracheal cuff balloons lie at the level of the glottic opening where they could potentially cause damage to the vocal cords. 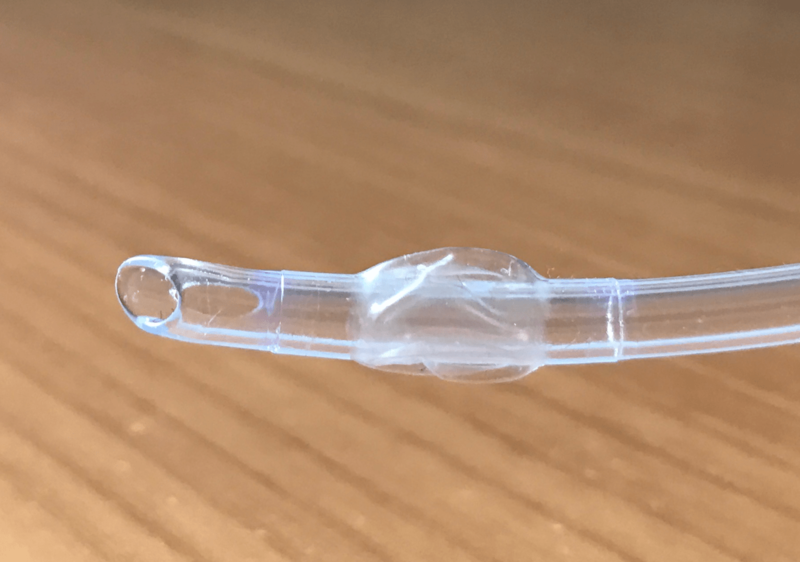 This study demonstrated the need for an endotracheal tube that was specifically designed for the paediatric airway and so the Microcuff tube was developed. It is important you know the accuracy of the depth marking on the brand of endotracheal tubes you use and we would recommend using one where the marking have been shown to be accurate in children such as the Microcuff tube. An alternative method to estimate how far to insert the endotracheal tube is to use one of the formulae below. No matter which method is used to estimate the depth of insertion this should be adjusted initially using auscultation (equal air entry bilaterally) and then by performing a chest radiograph (tube positioned midway between clavicles and carina). The size of endotracheal tube can be estimated using the formulae below. 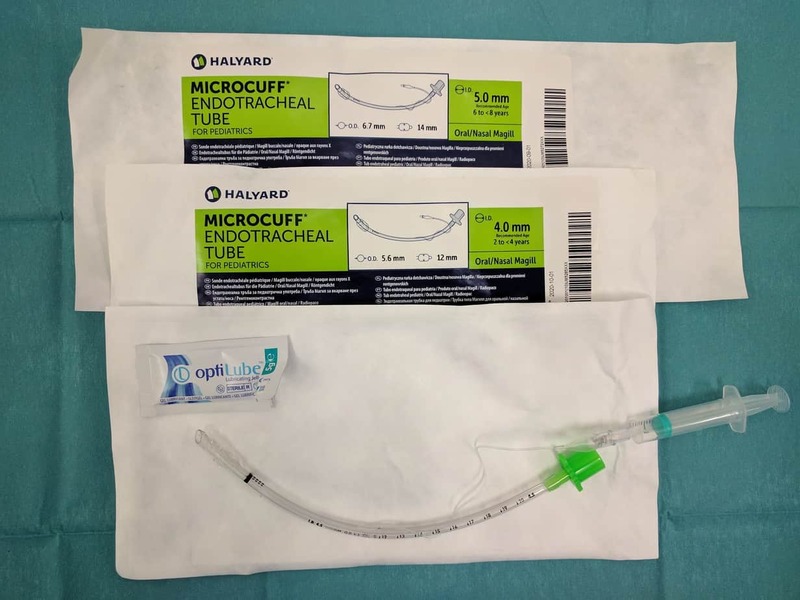 Note that the recommended size of a cuffed endotracheal tube is generally 0.5 mm smaller for the same patient than if an uncuffed tube is used. This is because the recommended size is based on the internal diameter of the tube and the presence of a cuff increases the external diameter of the tube. 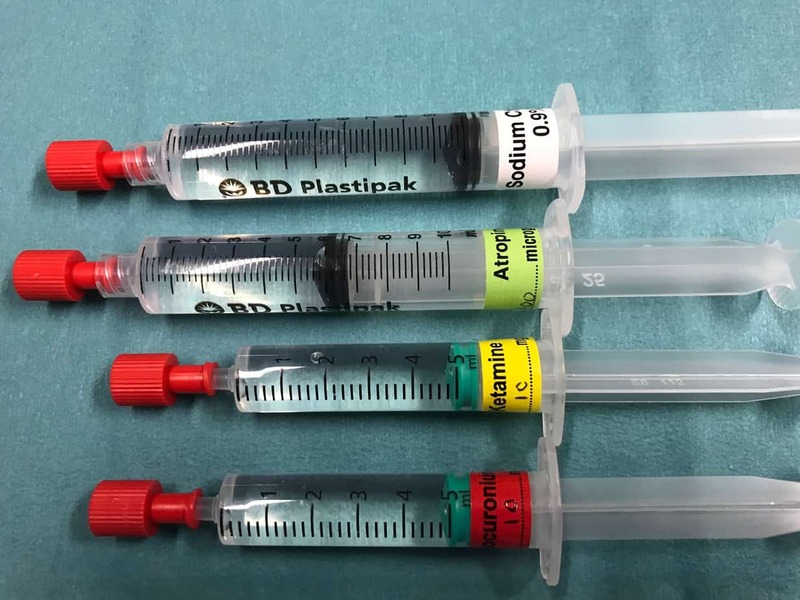 No matter what tube is used it’s tip should be lubricated prior to use, regardless of whether oral or nasal intubation is planned (lubrication helps passage through cords as well as down nose). If a cuffed tube is used it is important to check the cuff is not burst prior to insertion, by inflating and then fully deflating the cuff. Keep the syringe to hand to inflate the cuff following intubation and you will also need a manometer to check the cuff pressure (use the minimum pressure needed to stop audible leak, but don’t exceed 20 cmH2O). Also ensure you have the neighbouring sizes of tube available should your estimated tube prove too big or too small. The two most commonly used type of laryngoscope blades in children are straight blades e.g. Miller blade and curved blades e.g. MAC blade. 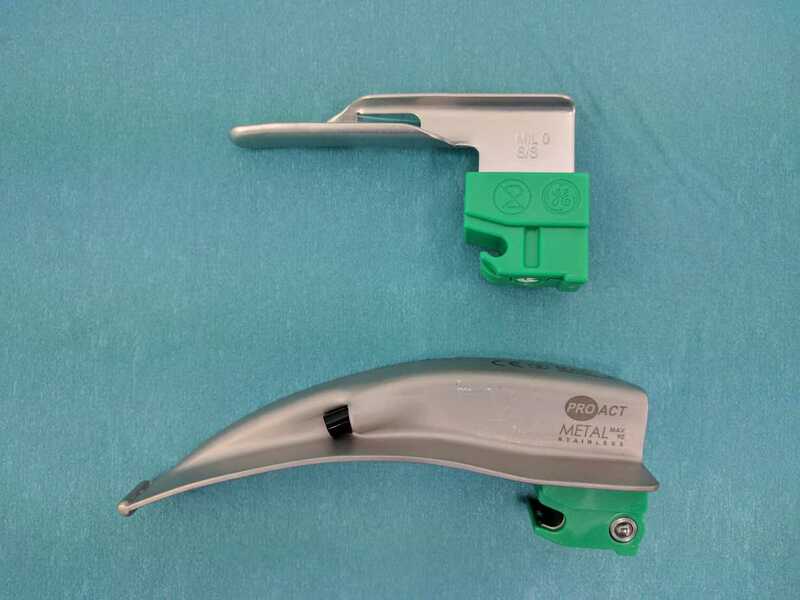 The straight blade is designed to directly lift the epiglottis out of the way, while the curved blade is designed to indirectly lift the epiglottis by exerting pressure on the glossoepiglottic ligament it in the vallecula. A straight blade is generally preferred in neonates and young infants as a combination of their large floppy epiglottis and laxity of the glossoepiglottic ligament in this age group often results in an incomplete laryngeal exposure when a curved blade is used. A curved blade is generally used from 6-12 months of age, however a straight blade can be used in all age groups depending on personal preference. When choosing the size of the blade it is important to remember that you should be able to intubate with a blade that is too large, however you will struggle to intubate with a blade that is too small (so if in doubt pick the larger blade). I would recommend using a miller 1 blade for term neonates and infants, a Miller 0 for most preterm neonates and a Miller 00 for extremely preterm neonates < 1kg. I normally use a MAC 2 from 6 months onward and switch to a MAC 3 around 5 years of age. It is important that you check the laryngoscope is working prior to use and that you also have a backup should it fail during use. Likewise it is important to have a different blade available should your primary choice fail due to reasons of size or type. The bougie is used when there is difficulty passing the endotracheal tube due to suboptimal view. In this setting the bougie is used to intubate the trachea and then the endotracheal tube is passed over the bougie into the trachea. 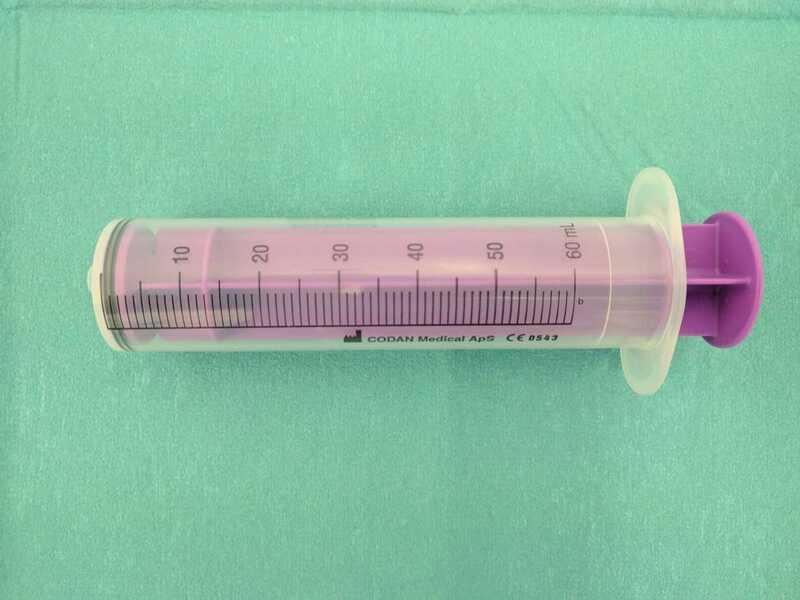 In a Cormack-Lehane grade 1 view use of a bougie is unlikely to be required as you should be able to pass the endotracheal tube without difficulty and as there is a slightly higher risk of trauma to the airway when using the bougie (due to it’s pointed tip), it should not be used unnecessarily. In a grade 2 view getting the endotracheal tube into the space under the epiglottis, but above the posterior cartilages can be challenging, however the smaller size and increased manoeuvrability of the bougie normally makes this task straightforward. In this setting you normally can visualise the bougie passing into the trachea and you should stop advancing the bougie at the same distance you would the endotracheal tube to avoid causing trauma to the bronchus. With a grade 3 view it is not normally possible to direct the endotracheal tube blindly under the epiglottis and up into the airway, however due to the bend in it’s tip the bougie is designed to do just that and the bougie should be passed blindly under the epiglottis aiming for where you expect the laryngeal opening to be. As you can’t see the bougie enter the trachea you have to rely on clicks (the feeling of the bougie rubbing on the anterior tracheal rings) and hold-up (resistance when the bougie lodges in the bronchus) to confirm that it has entered the trachea rather than the oesophagus. With a grade 4 view the bougie isn’t helpful as its use relies on you knowing where the epiglottis is. The bougie is one of the most useful bits of equipment for getting out of trouble with a difficult airway and an appropriately sized bougie should be immediately at hand for every intubation. The bougie comes in three sizes (table) and if the tube you plan to use is the smallest that will fit over the bougie you are probably better to use a smaller bougie size so that you can use a smaller tube if your planned tube is too big. The stylet is designed to stiffen the endotracheal tube and allows it’s tip to be bent with the aim of helping with intubation. There is often a lot of debate about whether a bougie or a stylet is more useful and a lot of this comes down to personal preference. One of the disadvantages of the stylet is that you need to have it in the endotracheal tube prior to the intubation. This means you will use it for every intubation regardless of whether it is difficult or not and as it stiffens the tube there is an increased risk of trauma to the airway. On the other hand with a bougie you only use it when you can’t pass or think passage of the endotracheal tube will be difficult so by using it in preference to a stylet you limit the number of patients at increased risk of airway trauma. 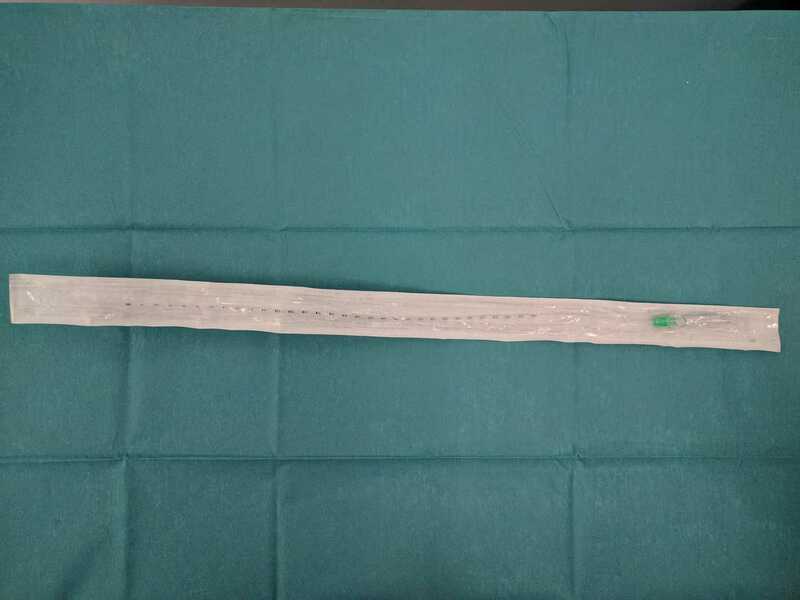 Due to it’s smaller diameter the bougie is probably more useful than a stylet in a Cormack-Lehane grade 3 view, however getting the bougie into the airway is by no means a guarantee that the endotracheal tube will always pass over the top of it. 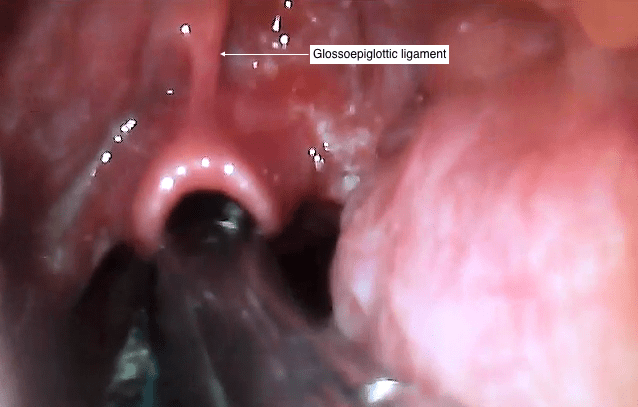 Use of a stylet is required when using a hyperangulated video laryngoscopes such as the GlideScope. It is important that the tip of the stylet doesn’t protrude from the end of the endotracheal to help reduce the risk of airway injury and a straight to cuff or hockey stick shaping when using a stylet is recommended as you generally have better control and less obstruction to the view of the cords when passing the tube compared to an arcuate shape. 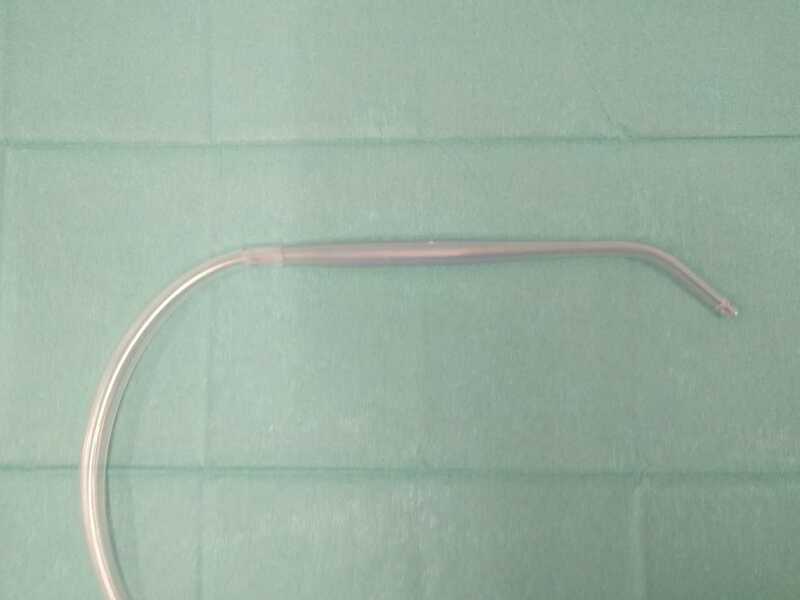 While in adults it is normally easy to manipulate a nasal tube into the tracheal without use of forceps, due to the smaller and more anterior paediatric airway Magill forceps are generally used to lift a nasal tube into the trachea. Care should be taken not to damage the cuff on the endotracheal tube with the forceps. 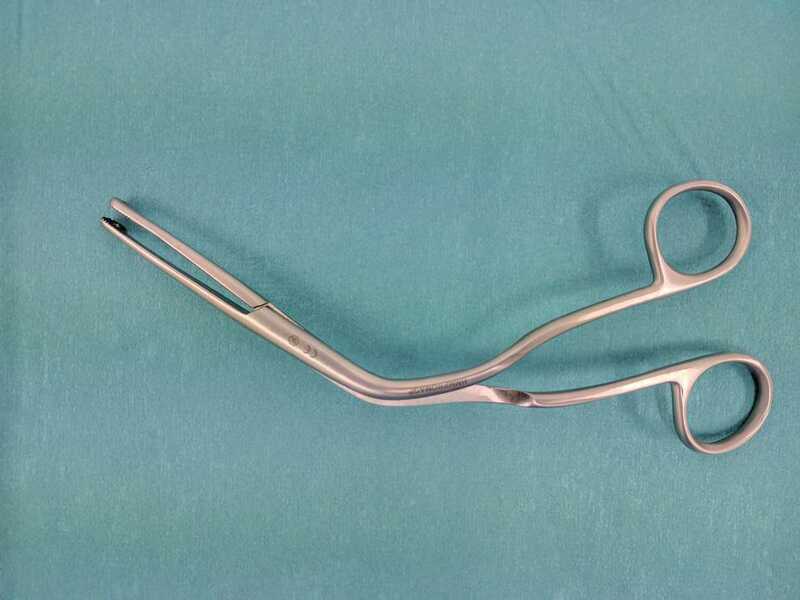 I would recommend leaving your forceps to the right of your patient’s head positioned the correct way round (with the top of the sterile pack removed) rather than have your assistant pass them to you, as frequently they are passed the wrong way round and in readjusting the view of the airway is often lost. 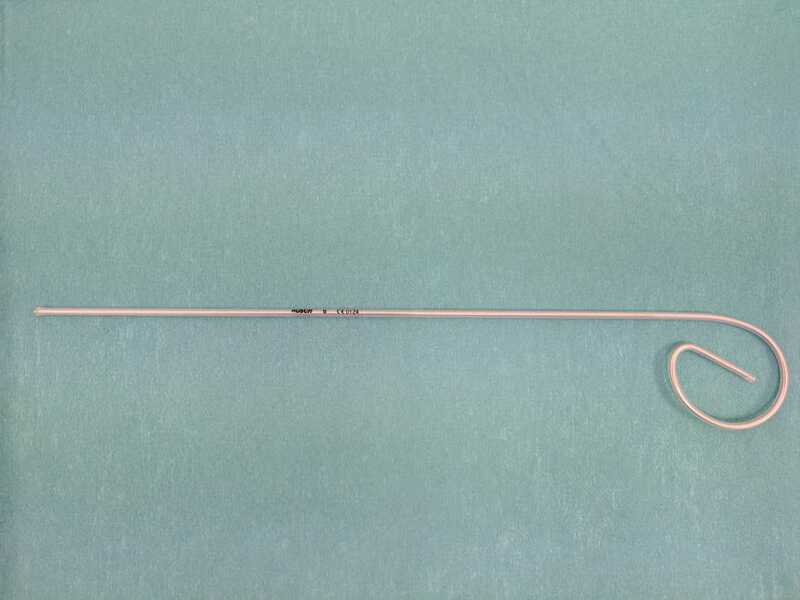 Magill forceps should be available even for oral intubation as if a foreign body is found in the airway you need to have a method of removing it. 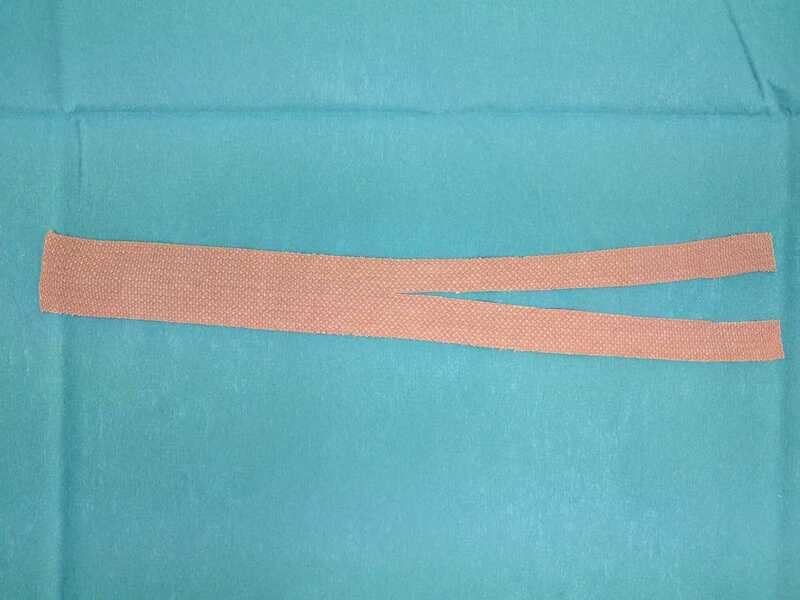 There are various methods of securing the endotracheal tube including ties, tapes and commercially available external fixation devices. It is important that you are familiar with what ever method you plan to use as a poorly secured tube puts the child at risk of unplanned extubation, which is unlikely to be tolerated well in a critically ill child. Consider applying compound benzoin tincture (friar’s balsam) to the face prior to applying the tapes to improve their adherence (see Securing the Endotracheal Tube for more information). The above equipment is required for all intubations and contains some adjuncts to manage both difficult face mask ventilation and difficult intubation initially. More advanced equipment that the team are familiar with should be immediately available to deal with problems that can’t be dealt with using the above equipment. 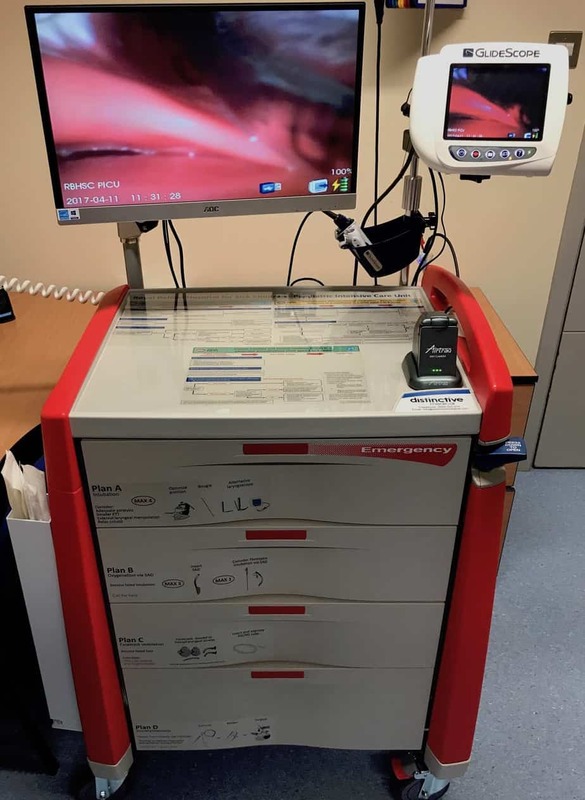 Advanced equipment included laryngeal masks, video laryngoscopes, cricothyroidotomy equipment etc and should generally come as a package as part of a difficult airway trolley to be used in conjunction with Difficult Airway Society (DAS) guidelines. If you don’t have a difficult airway trolley DAS provide assistance on how to set one up. If the intubation is expected to be difficult this should be brought to the bed-space, however even if problems aren’t anticipated it must be immediately available when called on. The drugs required for intubation (induction agent, muscle relaxant and rescue medications) are covered in detail in the Intubation Pharmacology chapter. Ensure you have labelled and double checked the doses and are aware of any allergies or contraindications to use in your patient. Airway Doctor 2 – This is the person who will take over doing the intubation should Airway Doctor 1 be unable to intubate (they should generally be more experienced). If this will be the team leader then its needs to be agreed at this stage who will take over the team leader role whilst they are managing the airway. Airway Assistant – This is the person who will pass equipment to the airway doctor. It is important that the airway doctor briefs them on what they what them to do e.g. to pass or not pass the suction catheter, how they would like to manage external laryngeal manipulation. Drug Administration – The preferred intubation drugs and their doses should be confirmed. NGT Aspiration – During face mask ventilation to prevent the stomach becoming distended and impairing ventilation/increasing aspiration risk, requires a member of the team to continuously aspirate the nasogastric tube. Cricoid Pressure – Cricoid pressure is posterior pressure applied to the cricoid cartilage designed to occlude the oesophagus and prevent regurgitation and aspiration, it should not be confused with external laryngeal manipulation which is designed to improve the view of the laryngeal opening. While regarded as a standard of care during rapid sequence induction for many years this is actually based on weak evidence (see video summarising the evidence) and it’s use does not come without problems as poorly applied cricoid pressure can impair the view and prevent intubation. With this in mind we don’t recommend the routine use of cricoid pressure when intubating critically ill children and its use should be considered on a case by case basis. 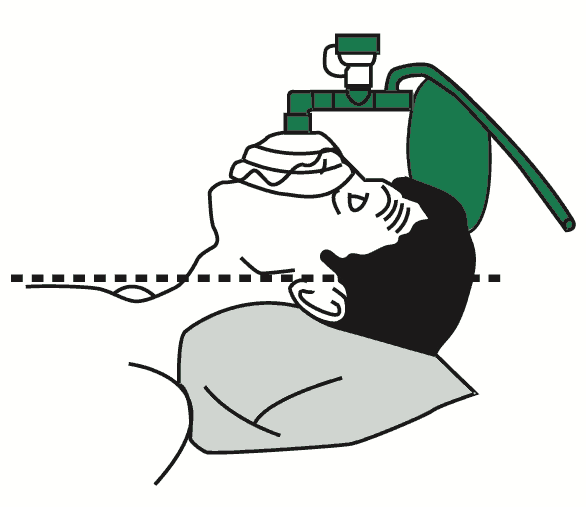 Manual in-line stabilisation – When intubating a patient who is at risk of spinal cord injury if the neck is extended during intubation, the collar (if present) is normally removed and a member of the team holds the head and neck still during the intubation. It is important to anticipate what could go wrong and firstly to consider if there are there any steps that could be taken to prevent or reduce the risk of the adverse event happening. Secondly a plan should be made of what action should be taken and by which team members, should the adverse event happen. This should cover things like failure to intubate, cardiovascular instability on induction of anaesthesia, situational problems such as considering moving location to theatre or intensive care and calling for specialist help or equipment should be considered. Importantly this should be specific to both the individual patient and the circumstances e.g. a patient with myocarditis and known Cormack-Lehane grade 1 airway, who is being prepared to be intubated in PICU by a consultant intensivist. Here the likely problem will be cardiovascular collapse on induction, so the discussion should focus on steps about how to best prevent this from happening (optimising haemodynamics) and briefing the team about the high risk of arrest on induction and having an ECMO team on standby prior to starting, rather than a detailed discussion and a plan for can’t intubate, can ventilate. It is important to allow time for questions and comments from all team members and to confirm the plan at the end. As you can see from this chapter there is a lot to remember when preparing for intubation and forgetting just one thing can have disastrous consequences and this is why we recommend using a checklist. 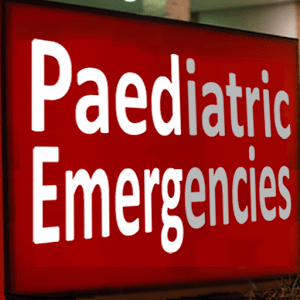 The Paediatric Emergencies Checklist comes in two parts. 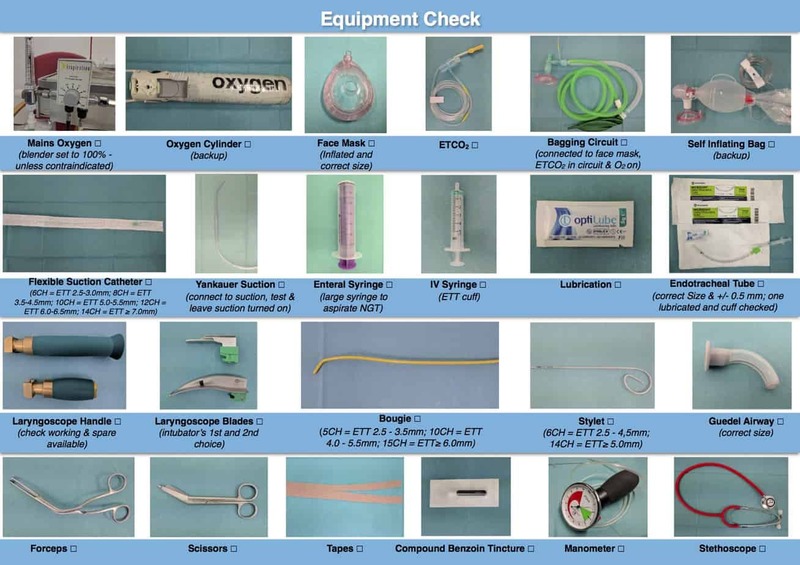 There is an equipment check which helps when preparing all the essential equipment required for intubation (can be done prior to assembling all the team) and there is the actual checklist that should be performed with all team members present prior to starting. A common reason given for not using a checklist is that as it was an emergency intubation there wasn’t time to do the checklist, but I would argue that it is in these circumstances where using a checklist is even more important as forgetting to do something is even more likely to have an adverse outcome.